He chose to stand even though there were available seats in the middle of the car. I’d been texting and didn’t notice when he boarded but he was now standing directly in front of me. Content and relaxed, he faced outwards through the window of the door casually taking in the morning view. A slender man. Petite almost. With a narrow waist and broad shoulders – across them a perfectly creased blue dress shirt. The sleeves were rolled up over his elbows and even these had the appearance of being pressed. The blue looked nice against his fair skin. His receding chestnut colored hair, still damp, curled loosely across his head. His beard, short and nicely trimmed, was slightly lighter and boarded on auburn. An aged brown belt of uneven color and containing a few scuffs held up thick cotton khakis. Sturdy. Comfortable. Not creased. Neither the weight of the cotton nor the thick belt conflicted with his otherwise delicate features. He repositioned himself as others boarded and when his back was to me I was able to again see just how broad his shoulders were. I wondered if he might be a swimmer. When he stood perpendicular to me, I could watch his eyes trace the structures as our train moved past them. The beige suede wingtips were fused to soles that were good for walking. They were laced with cream-colored laces – a very subtle touch and perfectly appropriate. His face and his expression did not give off the impression that he worked for this look. Rather, his manner of dress was natural. Casual. At one point he turned and faced me and I noticed that his belt had worn to notches that indicated he’d been thicker around the waist at one time. It was now on the last notch and wasn’t actually cinched, but hung just a bit. Still, it made him complete and I wonder if it was a reminder to himself of just how far he’d come, both in terms of time and in terms of effort. He’d had this belt for a while. He didn’t bat an eye when it brushed against the top of his leg. Gently moving from the fabric of his shorts to the skin just above the knee. I watched it as it danced lightly across both surfaces. He boarded the train at the stop after I did and sat directly across from me. No headphones. No reading material save for the screen of his phone. Uncharacteristic for a man of his age at this time of day. Slender. Plaid shorts. A red v-neck t-shirt. His tanned skin was the same color in all locations, including his head – which had been shaved a couple of days earlier. He sat quietly with his thoughts. At Belmont the train filled to standing room only. A young man boarded caring a backpack. Before grasping reaching up for the standee bar, he hoisted his backpack into place. This action blocked my view of the seated man I’d been watching. When the train arrived at Fullerton the train filled even more. The young man moved inwards and with that my view of the seated man returned. The backpack now perched directly above the seated man’s lap. As the train swayed to and fro the nylon straps of the young man’s backpack hung like tendrils over the seated man’s legs, fluttering as delicately as an aphid over a patch of clover. I looked at the face of the seated man expecting to see expressions of disapproval. There were none. The sensation, which could surely be felt, was either something he expected or something for which he longed. An expression of bliss would have been inappropriate even if it had gone unseen. It wasn’t until she put on her sun glasses that I noticed that she looked like Elizabeth Taylor. Dark sweeping hair. A long strand of pearls resting atop her cleavage, exposed by the deep cut neckline of her black blouse. The woman setting next to me is doing the same thing, though she’s no Elizabeth Taylor. She was applying her make up when I got on the train. I try to read but I’m distracted by the proficiency that these two women have with their morning routine. At Wilson a man boards the train. 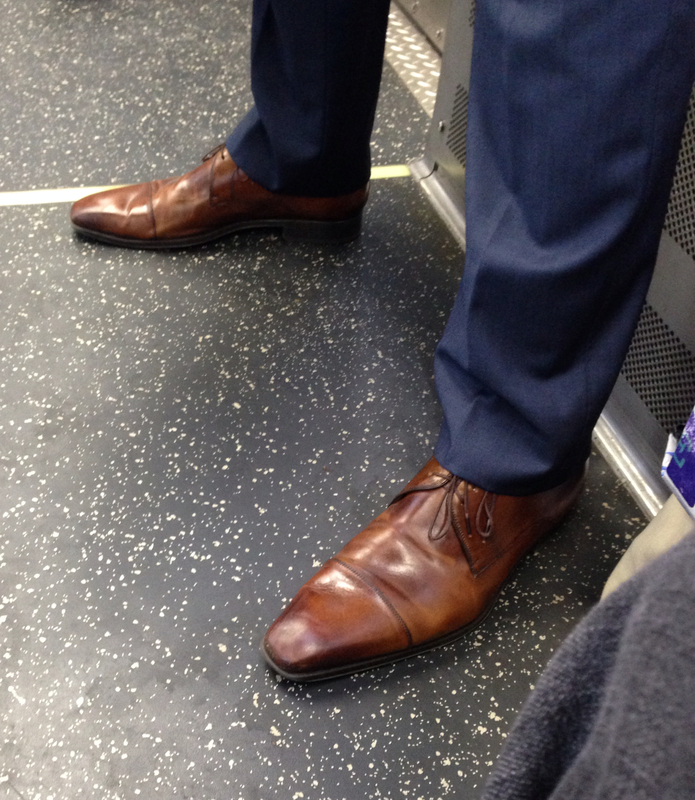 His shoes are brown – the preferred color of shoes by men in Chicago. His pants are a light grey plaid. He’s wearing a dark grey vest, buttoned, over a crisp white shirt. Everything that he’s wearing is perfectly in line for a inbound commute on the Red Line, except that each article of clothing is too large for his frame. I look up at his face. He’s young. Not much over twenty and I try to determine where he’s going as well as what brought him to Chicago. It’s evident that he’s not from here though I can’t pinpoint why, save for the oversized clothing. His actions and lack of reactions indicate that he’s used to riding the L. He holds on to the bar overhead with one hand and reads a book that’s held in the other. The changes in the track that cause the train to sway do not disturb him. He’s not eyeing the crowd. He’s adept. An indication that he’s been here for awhile.